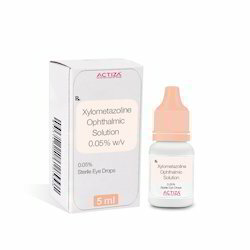 Providing you the best range of xylometazoline nasal drops, gentamicin eye drops, carboxymethyl cellulose sodium eye drops, moxifloxacin and ketorolac eye drops, ofloxacin eye drops and tobramycine sulphate eye drops with effective & timely delivery. We are leading exporter and manufacturer of Xylometazoline Nasal Drops. Xylometazoline Nasal Drops exporter in India. We are leading exporter and manufacturer of Gentamicin Eye Drops.Uses Gentamicin is used in the treatment of bacterial infections How it works Gentamicin is an antibiotic. It kills bacteria by inhibiting synthesis of essential proteins, required by bacteria to carry out vital functions.Common side effects Vomiting, Nausea, Facial swelling, Allergic reaction, Lip swelling, Skin rash, Joint pain, Blisters on skin, Diarrhoea, Shortness of breath, Headache, Hoarseness of voice, Loss of appetite, Itching, Urticaria, Fatigue, Fever. Gentamicin Eye Drops exporter in India. We are leading exporter and manufacturer of Carboxymethyl Cellulose Sodium Eye Drops. Carboxymethyl Cellulose Sodium Eye Drops exporter in India. We Are Leading Exporter And Manufacturer Of Moxifloxacin And Ketorolac Eye Drops. Moxifloxacin and Ketorolac Eye drops exporter in India. We are leading exporter and manufacturer of Ofloxacin Eye Drops. Oflaxacin Eye drops exporter in India. We are leading exporter and manufacturer of Tobramycine Sulphate Eye Drops. We are leading exporter and manufacturer of Neomycine and dexamethasone Eye drops. Uses Neomycin is used in the treatment of bacterial infections How it works Neomycin is an antibiotic. It kills bacteria by inhibiting synthesis of essential proteins, required by bacteria to carry out vital functions.Common side effects Uncoordinated body movements, Itching, Eye irritation, Increased saliva production, Nausea, Renal injury, Increased sensitivity to light, Eye pain, Diarrhoea, Allergic reaction, Tingling sensation, Eye surface inflammation, Vomiting, Abnormal blood cell, Drooping eyelids, Altered pupil size, Increased bilirubin in the blood, Pain, Skin redness, Numbness, Disorientation (alteration of mental status), Increased production of tears, Abnormal eye sensation, Increased intraocular pressure, Increased liver enzymes, Fever, Ear damage, Blurred vision, Mouth ulcer, Premature destruction of red blood cells, Allergy, Confusion, Thinning of eyes, SwellingDexamethasone(0.1%)UsesDexamethasone is used in the treatment of allergic disorders, severe allergic reaction, asthma, cancer, rheumatic disorder, skin disorders, eye disorders and nephrotic syndromeHow it worksDexamethasone belongs to a group of medicines called corticosteroids. It prevents late phase allergic reactions by preventing release of chemicals responsible for allergy.Common side effectsElectrolyte imbalance, Delusion, Thinning of bones, Blurred vision, Increased appetite, Fluid retention, Redistribution/accumulation of body fat, Bone degradation, Increased intraocular pressure, Increased risk of infection, Fracture, Psychosis, Increased hair growth, Muscle disorders, Allergic reaction, Hypersensitivity reaction, Decreased potassium level in blood, Suicidal thoughts, Extremes of being happy or sad, Tendon rupture, Salt and water retention, Weight gain, Swelling. Neomycine and dexamethasone Eye drops exporter in India. We are leading exporter and manufacturer of Moxifloxacin HCL Eye Drops. We are leading exporter and manufacturer of Bimatoprost Eye Drops. Bimatoprost Eye Drops exporter in India. We are leading exporter and manufacturer of Betaxolol Eye Drops. We are leading exporter and manufacturer of Dorzolamide and Timolol Eye Drops. 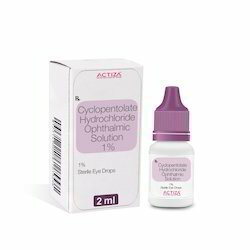 We are leading exporter and manufacturer of Cyclopentolate HCL Eye drops. We are leading Exporter and Manufacturer of Chloramphenicol Antibacterial. Chloramphenicol Antibacterial exporter in India. We are leading Exporter and Manufacturer of Atropine Sulphate Mydriatics. Atropine 1% eye drop is used in the treatment of bradycardia and inflammation of the uvea. Atropine Sulphate Mydriatics exporter in India. Looking for Eye & Ear Drops ?